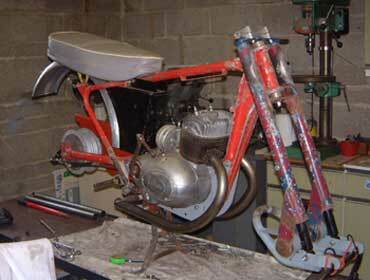 We have full workshop facilties for working on your bike, whether it be a small one off job or a complete restoration. Bikes can be stripped, shotblasted and powder coated then totally rebuilt including wheelbuilding and engine refurbishment. The end product is just like the original machine that left the Greeves factory some thirty years previous. Should you be thinking of having your Greeves fully restored please allow between �1000 and �2500 and about three months of working time for it to be completed. Some may take longer depending if any parts are missing. Part restoration work undertaken prices on application. Since resurrecting Greeves Motorcycles in the year 2000, we have received some interesting projects. Besides mail order requests which, incidentally have resulted in over three thousand five hundred customers, we have built twenty-two Greeves Anglian machines together with four Greeves Pathfinders and carried out several restorations plus sold over ten second-hand machines. The various jobs that we have taken on, including engine refurbishments, making the odd parts that people have missing off of their bikes or modifications that they require, has been not only a challenge but enjoyable too. 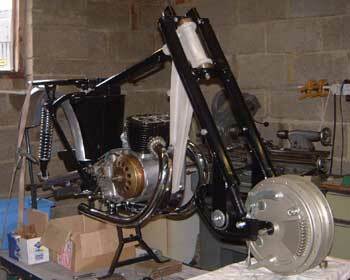 Our latest order, to cap it all, is to build a Cafe Racer motorcycle with a 2T-twin engine. A customer who does not cut corners has requested this! Our spec, after our customer seeing an Essex Twin we were building and a 325cc Greeves; was to build a bike like no other to include chrome engine plates, chrome headlights and tail light, metallic swinging arm and Mudguards and also a 9" Gremeca twin leading shoe with twin acvators. All this is fitted into a leading link fork with a short Silverstone loop. So�what did we do? We have begun carrying out our customer's request after first of all, finding the largest shoe horn we could (joking apart) we finally managed to get the hub to fit but it was a bit tight. The frame is from a 25 DC early model from the dry build and the frame has been shot blasted and powder coated Black. The engine plates are chromed. The twin pipes have been set up at the back to take two re-silenced 17" megaphone silencers, which will be slightly up-swept. The engine has undergone a complete refurbishment, repaints and rebore together with having new pistons fitted. We intend fitting a standard British Hub Co 6" hub in the rear with 1 1/8 shoes. Chromed spring shocks 13.2 have been fitted to raise the back. 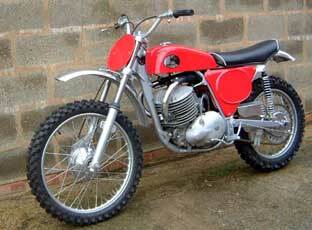 The bike will be fitted with a chrome head and tail lamp, an 18" front wheel and close mudguard. The engine now has a 26mm Amal concentric carb' on an original Greeves twin manifold. The manifold will have chrome rims. The tank will be Black with a special Greeves logo that we have designed. We believe that the Cafe Racer will look and perform extremely well. We still quite a lot of work to do on this bike but it should be on the road shortly after Christmas 2005�so keep a look out for it. This bike will available to view at some shows that we are intending to visit in 2006 along with bikes that we have in our collection here at Greeves and also customer's bikes that we have worked on. This machine arrived here at Greeves as a basket case. It arrived in several parts as the owner had dismantled as much as he could to transport it. The bike had been buried in a Blackberry bush! The bush was growing through the frame and the wheels had more or less collapsed! The tank had a large hole in it and the seat and base were full of rust. The forks had seized up, there was no damping whatsoever and the rear shocks were solid and had the old gas bottle attached. We understand that three months of negotiation took place before the present owner was even able to purchase the bike! Before starting work on this machine, we soaked everything in oil and WD40 and left it for over a week. Gradually the fork tubes could be removed from the sliders. The shocks were disposed of, as they were not any good. The brake plates had seized in the hubs but we did manage, through gentle pressure, to ease these off to reveal a lot of White powder where the drums had been full of water and the break shoes had been oxidised. These, like the bearings, were just solid. Eventually we managed to strip the bike. After shot blasting the frame, a thorough inspection of the bike was carried out. Other than a small amount of work to a footrest and the back loop, the frame was primed and powder coated Silver and likewise the swinging arm. After new bushes were fitted and we were ready to start building. The engine had had a complete nut and bolt overhaul, new Griffon gearbox fitted, the barrel has been relined and fitted with our new Griffon piston with tapered rings. Also, the crank had to be split and rebuilt due to the bike standing for around ten years! This bike has also been fitted with a new advanced coil electronic system, new rims, and a new rear conical hub due to the sprocket holes being elongated in the old one and too bad to reuse. 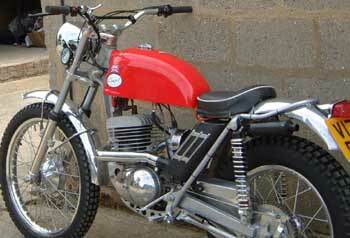 We have also fitted a new seat, tank, logos, side panels, and carburettor etc. The Griffon is now a very quick, punchy and lovely looking machine! It has the original exhaust system which, when heard is absolutely awesome! It has cost the owner a few �'s to bring his bike back to life, but it is worth every penny! We manufactured this Greeves Anglian machine in the year 2000. The bike was built purely for the trials with all of the usual trials parts including extra low second gear, 60-tooth rear sprocket and no lights etc. The bike became available after four years with only a few miles on the clock, which encouraged us to re-purchase it and bring it back here to Greeves. It has now been sold on to a new location in the South of England and is being used as a mode of transport to and from work and also we understand as an off road bike for following trials. The Anglian now has a three-gallon tank rather than a five-litre tank. The bike has now been fitted with road gears, chrome headlights, tailights, road trial tyres with a hand, electric hooter, the electrics have been reset, a stoplight, a longer seat and a smaller sprocket. The bike's new owner has to allow an extra fifteen minutes when filling up with fuel due to people expressing an interest and wanting to talk about the bike more! This is a Greeves Challenger MX 5 ISDT owned by a customer from Italy who is the chief mechanic for the Ducati World Superbike team. This machine has been totally refurbished. The forks which were Ceriani have now been changed to banana forks, which were manufactured and supplied by Greeves Motorcycles. This was configured using a Greeves Griffon frame and a new aluminium beam which were married together to form a robust construction designed to hold the 500cc Triumph engine. On this machine Greeves Griffon hubs were used and a 12volt lighting system installed. 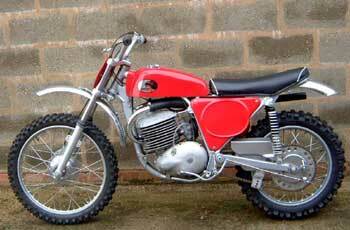 This is a Greeves TCS 250cc which literally started life as a basket case. A few notes: front leading link fork has been strenghtened, the brake plate anchor arm has been moved so that the forks go down instead of up on braking. The machine has been shortened by two inches. The ground clearance has been heightened by three inches. The TCS has also been narrowed at the back end, hence the rear shocks lining up with the forks. The tank has had two inches cut out of the middle and the engine is now a square barrel not as shown in these pictures, with a Mikuni carburettor and power filter. This is a Greeves RAS Silverstone which was recovered after many years and totally refurbished including the installation of electronic ignition. 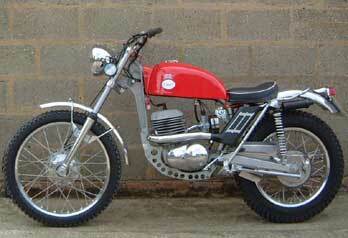 This machine is the original Greeves RAS Silverstone pre production machine owned by Reg Everett. This machine has undergone total refurbishment, including powder coating the frame. The engine has been completely overhauled. It has had new tyres, chain, sprocket and the seat has been reupholstered. The MX3 250cc is having it's forks changed from Ceriani to leading link. This machine is being converted to allow it to be used in hill climbs.